It was in the hot days of late June that we had the chance to call in on Caroline and Sean Feely at Chateau Haut Garrigue in Bergerac (24, Dordogne, Aquitaine), a warm and welcome memory on cold miserable winter days. An unlikely combination of Ireland, South Africa and rural France has created an organic vineyard which is rapidly gaining a reputation for the quality of its wines – and an innovative approach to promoting both the appellation and the organic ethos. 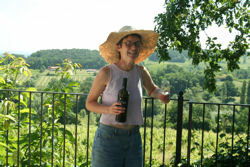 Also running under the banner of Wild Earth Vineyards, Caroline is passionate about encouraging people to appreciate and understand her organic wines. With a delightful gite (holiday rental accommodation) enjoying stunning views over the Dordogne valley and the vineyards, regular vineyard walks (which include other local organic vineyards), tutored wine classes (in Bergerac and Ireland! ), longer vineyard walking holidays in Bordeaux, St Emilion & Bergerac – and other wine experiences which include trying your hand at being a winemaker for a day! – they offer plenty of ways of getting to know the wines and vineyard well. – a very low carbon footprint (we do much of our vineyard work by hand, we favour natural processes rather than intervention and we have an oak forest to offset our CO2 emissions) giving us all a better future. Well worth a visit if you are in the region, you can also order online for delivery to your door in the UK and Ireland. Interestingly many of the small independent vineyards in the Bergerac appellation are going organic – and not just for the “feel good” factor or as a marketing ploy – sustainable vineyards and a healthy environment are needed to support the complex combination of factors (e.g. soil, climate, rootstock and people) which have to come together to produce consistently good wines.